The Fellowship was fortunate enough to obtain a copy of THE LONE RANGER #14 from Dynamite Entertainment. The story is written by Ande Parks with art by Esteve Polls, colors by Marcelo Pinto, and lettering by Simon Bowland. The Lone Ranger and Tonto have joined a local sheriff and his deputies in pursuit of a killer. Things turn into a standoff in the middle of the open prairieland. Our heroes decide not to make a move until dark. As night falls, Tonto circles around their target and jumps him. He finds out it’s the soldier he let go after killing the others who were responsible for the raid on his tribe. The soldier tells him what has happened to him since that encounter. Will Tonto complete his revenge for what happened to his people? I’ve enjoyed this version of Ranger and Tonto – a more realistic view, but they still fight the good fight. This issue is a hard one because you sympathize with both characters, and you are hoping things don’t get any worse than they have. Maybe it’s me, but I see a John Severin influence in Esteve Polls’ art. It is simple, yet beautiful and effective. We need more western comics, especially as well written as this one. 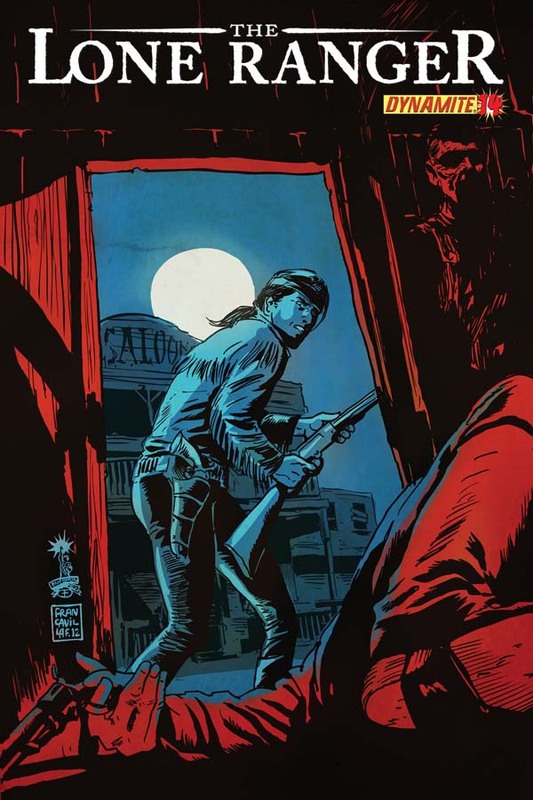 THE LONE RANGER #14 is in stores now or available at www.dynamite.com.